Charles Barkley and Stephen Colbert made a March Madness wager for the Auburn Tigers game Friday. News of the heroic Verizon worker in Philadelphia who rescued a cat stuck atop of a telephone phone, only to be suspended for breaking safety protocol, was not lost on "The Late Show" Stephen Colbert. During the "Meanwhile" portion of Wednesday night's show, Colbert joked that the cat stayed on the pole for so long simply because the was specified service window Verizon has given for the rescue. The host also noted how the Verizon worker Maurice German, who did the good deed on Friday, was suspended for violating safety protocols for using company equipment to reach the cat. "It sounds bad, but it makes sense given Verizon's slogan: Verizon. Let the cat die." A GoFundMe campaign has been launched to help German while he is suspended. As of Thursday morning it had exceeded it's goal of $2,400 with $3,395 collected so far. 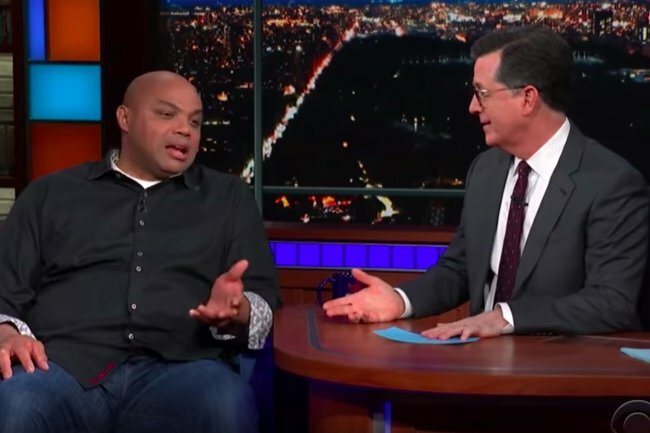 Later in the show, Colbert welcomed NBA Hall of Famer and former Sixer Charles Barkley as a guest, the pair making a wager for the next Auburn Tigers game, ahead of the team – and Barkley's alma mater –taking on the North Carolina Tar Heels in the NCAA Tournament on Friday. Depending on who wins, we'll see either Barkley or Colbert wearing a very ugly tie on TV in the next few days.